Crab is one of the few foods you can easily get anywhere in the world. 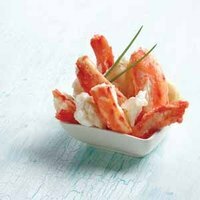 With crabs inhabiting most of the world, and coming in sizes of just millimeters to 4 meters (Japanese Spider Crab), it is not a hassle to come across crab meat. Cooking crab meat doesn't have to be a hassle either. Fill a pot with one inch of water. For larger crabs, make sure the water level is high enough to cover the entire body of the crab. Add vinegar and salt to the water. You can vary the amount of salt. Or, if you want a sodium free meal, you can eliminate the salt all together. However, vinegar is an important ingrediant and must be added. Bring water to a boil. Once water is boiling, immediately add the crab. Use a fork to adjust the placement of the crab. It is very important that the crab is submerged completely under water. Let the crab steam for approximately 25-30 minutes. You can prepare side items while you wait. Remove crabs from boiling water and let them cool momentarily. The vinegar should have made the crabs easier to pick apart. Serve with your favorite side dish and enjoy. Before cooking, make sure the crab shells are clean and have been kept refrigerated.